Here’s some of my custom tooled leather keychains. Custom orders are possible, add your name etc.. Custom tooled leather keychains from 26.00 and less. 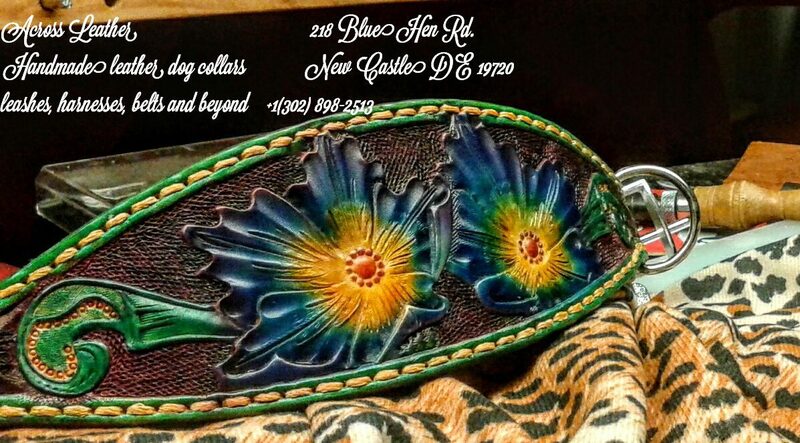 Be part of your pets creative custom tooled leather collar. Applying stitch grooves recesses the thread or cord to almost the same height as the main body equalling stitches that last decades. Above is a double stitch groove. One groove going the length for my standard protocol and the other is an embellishment. The shoe glue I utilize is referred as a nail less glue. I hand stitch to guarantee strength and endurance of layers. Each collar is created with safety, comfort and style in mind. High quality in every facet is what’s used during the whole creative process. Starting with saddle skirting leather main body shoe glued to vegetable tanned leather liners. Hours of hand tooling, edges beveled, stitch grooved, hand stitched with waxed linen or wound cord thread. Airbrushed spirit dyes, hand dying and painting spirit dye and acrylics. Edges burnished to perfection to appear acrylic likeness. The buckles are Solid Brass, nickle over Solid Brass, Stainless Steel and Sterling Silver upon request. It’s been a journey being self-taught. After 25 yrs I daily strive to be better with every piece I create and fully open to critiques, ideas and yearn for information imperative to create heirloom pieces. My desire to create is found in each piece, executed with all the skill and passion I possess in search of perfection.